The first approach in the communication will be from the side of the Earth, i.e. the large solid and fluid sphere which acts as a substratum for human observations. The earth is part of a Solar System, which formation took place some 5000 million years ago as a planetesimal accretion of long-dead stars. It was fairly early in the history of the system that the proto-Earth developed and cooled down to the Earth (4.6 billion years ago). A process of radioactive and gravitational heating led to a differentiated interior structure. Molecules of water, methane, ammonia, hydrogen, nitrogen and carbon dioxide were gassed out during the transformation. At the same time, atmospheric water was photo-dissociated by ultraviolet light in oxygen and hydrogen atoms. The former shaped an ozone layer, while the latter escaped into space. Around 3800 million years ago the crust of the earth was solidified, and the condensation of atmospheric water resulted in the oceans. The very beginning of the earth cannot be determined from (the sequence) of rocks, because the oldest rocks have been recycled and destroyed by the process of plate tectonics. Moreover, there are no determinable fossils in rocks older than 3500 My. Prokaryotic cells only started to develop after that tentative date. Biological (fossil) evidence is of little help to establish the first visibility of the earth, and the geological sciences had to resort to physics to come up with an acceptable answer. The age of the earth (and the Moon) is nowadays measured by the decay of long-lived isotopes of elements that occur naturally in rocks and minerals. This process is called radiometric dating. Its theory is grounded in physics and based on the half-life of isotopes: the time lapse during which a radioactive mass loses one-half of its radioactivity. In particular, the isotopic composition of lead, expressed in the ratio of lead-207 to lead-206, has proven to be a good indicator of the age of the earth. The ratio changes over time due to the decay of radioactive uranium-235 and uranium-238. Ancient rocks older than 3.5 billion years old are found in such divers places as Canada, western Greenland, Swaziland, and western Australia. Zircon crystals from the latter locality – found in younger sedimentary rocks – gave radiometric ages of 4.3. billion years. It must therefore be assumed that the earth has at least that age. The oldest dated moon rocks have ages between 4.4 and 4.5 billion years, which provide a minimum age, but fits in well with the history of the earth. Some meteorites have given ages from 4.53 and 4.58 billion years. It is fairly certain (if radiometric dating is accepted) that the earth gained its first visible visibility some 4600 mya. The Earth is part of a solar system, with our ‘Sun’ as the main point of attraction. The Sun is, in turn, a star amidst millions of stars in the universe. It is situated in a galaxy. A galaxy is a gravitationally bound system of stars and stellar remnants, with gas, interstellar clouds, dust and dark matter as contributors. ‘Our’ galaxy is visible at night in the form of the Milky Way and has to be visualized as a giant disk floating in an immense space. 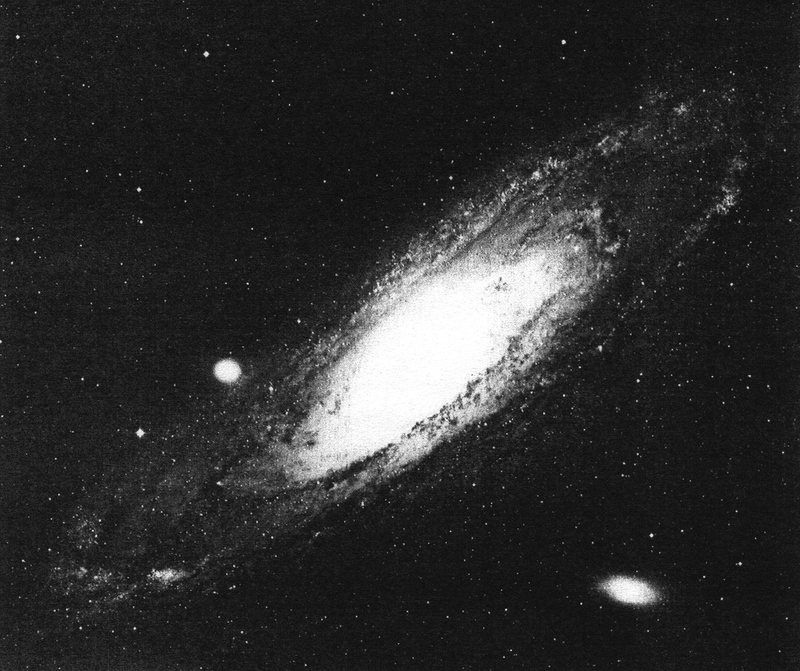 Other galaxies, similar like ours, can be viewed at great distances in the universe (fig. 82). Fig. 82 – The nearest neighbor of our own galaxy is the spiral galaxy M31 (NGC 224) in the direction of Andromeda at around 1.5 million light-years away from our galaxy. The object was known as the ‘little cloud’ to the Persian astronomer Al-Sufi, who described it in his ‘Book of Fixed Stars’. Two bright dwarf elliptical galaxies (NGC 205 and 221) are visible. The picture was taken with the Schmidt telescope at Mount Palomar (Photo: Hale Observatories). The dimensions and size of the universe can only be understood if our own position is known within its setting. This cosmic consciousness has to be built up in steps, starting from the observer and the present (OP) to a more general verity valuable in a longer period. These phases will now be followed in more detail and will end in a statement over the duration of the universe as the largest imaginable entity of Man. The first action is a specification of the Observer in place and time. The exact position of an Observer on a communication graph is all-important to know in order to draw any sort of conclusion with regards to visibility. The first question will be: where do we, as conscious members of the species Homo sapiens, stand in place and time on this Earth? Two Points of Recognition (POR) are chosen to pinpoint that position. The beginning of the communication cycle (between Man and Earth) is placed at the beginning of the Earth some 4600 million years ago. That seems a fair choice, supported by the scientific evidence of isotopic dating. The second POR is the beginning of the first appearance of the Large Visible Animals (LVA) on earth, of which the species Homo sapiens is a member. A date of 600 mya, situated in the so-called Vendian period, is chosen as the first visibility of the LVA’s. The first macroscopic fossils of soft-bodied organisms were found in the latest Proterozoic (2500 – 545 mya) and fit in the definition of LVA. They had a simply plan and resembled modern-day soft-bodied organisms such as sea pens, jellyfish and worms. It was only in the Cambrian Period and the beginning of the Phanerozoic (545 mya – present) that the first shelly fauna appeared. The dating of the first visibility of the LVA (at 600 mya) is – in all scientific honesty – an effort to make the ‘best choice’. However, this subjectivity is lately joint by a scientific correction of the ‘objective’ dating by radiometric methods. The beginning of the Cambrian Period (and therefore the Phanerozoic Eon) has shifted some 55 million years from 590 to 545 mya, which is about 10% of the total presence of the LVA’s. The following comparison (fig. 83) reflects the two different dates (of first visibility) and their consequences for the position of the Observational Present (OP) on the CF-graph. The start of the communication graph remains fixed at 4600 mya. It is also imaginable that new ‘corrections’ will change this date in the future, but this scenario will not be followed now. Fig. 83 – The comparison between the position op the Observational Present (OP) in relation to the choice of the First Visibility of the Large Visible Animals (FV/LVA). The First Visibility is chosen as 600 and 545 mya. The Observational Present (OP) moves relatively to the left (to FV) if the BU increases. The situation bears resemblance to the problems in the determination of the Observational Present by means of the visibility of the genus Homo (as earlier described on page 223). In the given example (of a changing starting date for the Ramapithecus) the First Visibility was fixed (at 4 mya) and the beginning of the communication cycle V was moved (from 15 to 24 mya). The OP moved in that example to the left, towards the FV. Now, in the example of the LVA’s on earth, the last sentence of page 223 (‘Where is the present?’) is put to the test. The First Visibility (FV) becomes flexible (changing the beginning of the first visibility of the LVA’s from 600 to 545 mya). The beginning of the communication cycle V (of LVA and the earth) remains fixed at 4600 mya. The result is an increase in length of the invisibility period O¹ (consisting of 5 BU’s) and a relative movement of the Observational Present (OP) to the left (towards FV). The Observational Present (OP) moves relatively towards the First Visibility (FV) if the communication cycle V is enlarged. The opposite of this ‘law’ is also true. It means that a narrowing down of the invisibility period O¹ (diminishing V) results in a dislocation of the Observational Present (OP) to the right, away from the First Visibility. The philosophical implications of this principle are – to say the very least – interesting. It seems as if we are dealing here with a ‘communicational spectrum shift’. The relation between the direction of relative movement (of an observer or observational present) along the communication graph and the changing length of the communication cycle (V) is established. The nature and setting of this relation, within the distinct ‘wave’ environment of the CF-graph, immediately brings to mind the so-called Doppler effect, as it is known in physics. The Austrian mathematician Christian Doppler (1803 – 1853) proposed this principle in 1842 in a publication called ‘Concerning the coloured light of double stars’. He noticed that the pitch of a sound would change if the source of the sound is in motion. An approach towards the observer leads to compression of the (sound) waves. Moving away results in a stretching of the waves relative to the observer. By analogy, the electromagnetic radiation emitted by a moving object also exhibits the same effect. A transposition towards the observer means compression (squeeze), which is visible in the spectrum as a shift to the right (blue). If the object moves away, there is a shift in the spectrum to the left (red). Radiation is red-shifted when the wavelength gets longer and is blue- shifted when the wavelength is shortened. The American astronomer Edwin Hubble (1889 – 1953) studied distant galaxies around 1920 and used the theoretical results of the Doppler effect. He noted a shift in the spectrum of Cepheids in nearby galaxies towards the red end and concluded that they were moving away from the observer (the earth). ‘Hubble’s law’ states that the distances between galaxies or clusters of galaxies continuously increase and that the universe is expanding. Edwin Hubble and the consequences of his law will be met later (in Chapter 6.4) in the discussion of the quadralectic universe. The ‘communicational spectrum shift’, as now observed in the CF-graph of the LVA’s, has a great similarity with the cosmic situation, although there are no actual spectral lines. However, the same principles with regards to relative movement seem to be applicable. The spectral ‘red shift’’ and ‘blue shift’ (as observed in moving galaxies) is replaced by a shift of the Observational Present (OP) on the CF-graph. The former (red shift) is seen when an expansion takes place and can be compared with the enlargement of the Basic Units (BU) and a longer communication cycle (V). The latter (blue shift) is the result of compression and comparable with smaller BU’s (and a smaller communication cycle V). The spectrum of the visible light is normally drawn on a linear scale from long wave/least energy/low frequency/red colour on the left-hand side to short wave/high energy/high frequency/blue colour on the right-hand side (fig. 83). A red shift (in physics) therefore means a movement to the left (on the spectral scale) and a blue shift a movement to the right. The directions of the Observational Present (OP) along the communication (CF) graph follow the same pattern as given in the physical example of light waves. An enlargement of the communication cycle V (‘red shift’) results in a movement of the Observational Present (OP) to the left (towards the FV). A diminishing of the communication cycle V (‘blue shift’) leads to a movement of the OP to the right (away from the FV). Fig. 84 – A comparison between the physical characteristics in the spectrum of visible light (above) and certain features of the communication cycle V (below) in a quadralectic setting. The theoretical implications of the comparison might be further explored, to find the rate of a shift. The number of ‘beginnings’ (or First Visibilities) of the Large Visible Animals (LVA’s) is in this investigation extended to four. The beginning of the communication cycle remains fixed at 4600 mya, generally accepted as the age of the earth. 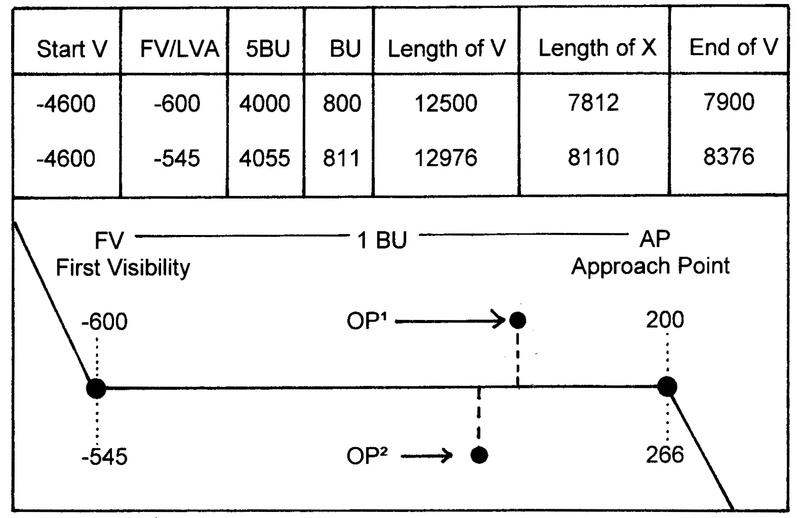 The following lengths of a basic unit (BU) can be calculated for the various FV-values. The length of BU can now be plotted against the First Visibility (FV). The result is a linear correlation (fig. 85). Fig. 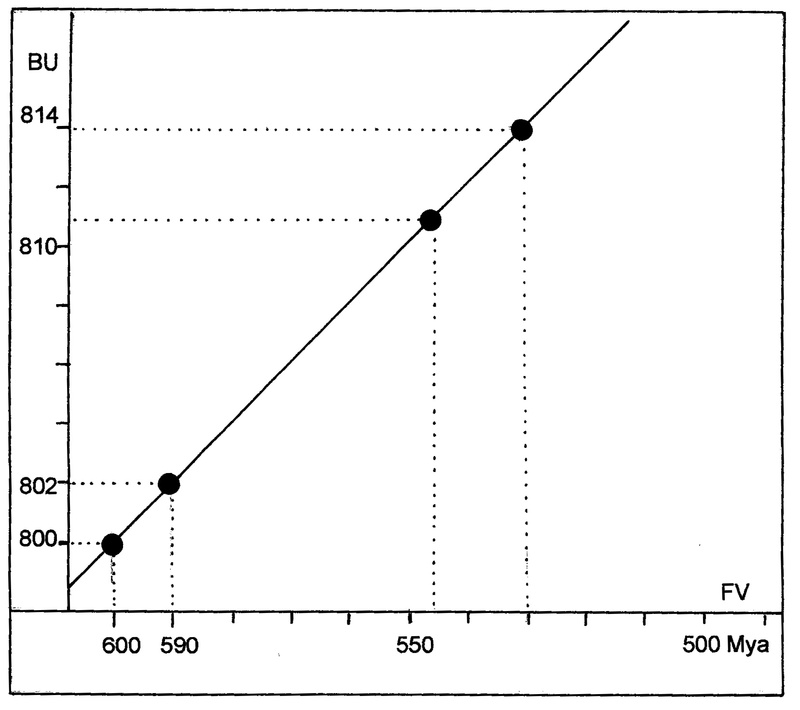 85 – The representation of a graph, showing the linear correlation between (four) different First Visibilities (FV) of the Large Visible Animals (LVA) – given on the horizontal axis – and the corresponding Basic Units (BU or 1/16.V) – as marked on the vertical axis. The last example shows the highly hypothetical case of the ‘sudden appearance’ of the Large Visible Animals (LVA) in the observational present of today. The Observation Present coincides in the latter case with the First Visibility of something we already know to exist! The First Visibility is no First Visibility after all, it is now. The circle is closed. These observations must have a psychological meaning for an observer in the present. Some might even find the outcome disturbing. A subjective choice – based on objective facts – led to an outcome in which the observer has to doubt the very foundation of visibility (which was initially based on a First Visibility). The outcome points to a weird form of ‘transcendental geology’, an untraditional direction, which has not been described before. These genuine investigations – based on established scientific facts – could never be verified, neither now nor in the future. (Earth) history might get a new appearance, but its features will not be recognized in the present world of academic thinking. Why do observations with a micro- or telescope contribute to a progress in science and why do the results of a probing in space and time by the CF-graph not qualify to be scientific (at present)? The answer is a matter of emplacement: the former efforts are rooted in the Third Quadrant, while the latter endeavors are situated in the Fourth Quadrant. The microscope and the CF-graph are examples of dissimilar types of observation aids located at different points in the communication. A light beam going through the lenses and/or bouncing on mirrors gives a visible pattern, which is recognized as an objective physical entity. Certain subjective meanings only enter the observational reality in the interpretation stage (like the use of spectrum analysis). Visibility derived by the CF-graph also results in patterns and a perceptional reality, with the subjectivity as a given fact within itself. The choices (of the Points of Recognition) are indicated, and a new reality develops after that choice. There should be no hierarchical classification of these two types of intellec-tual navigation. Both approaches are just as valuable in the understanding of the world. The most important thing to know, in any communication, is probably our own position as an observer and make that clear.